In 2006 planning consent was granted to Charles Church Homes for the construction of a new playing field on a parcel of grazing land to the east of St Ann's Heath School, Virginia Water, as well as a new housing development on part of the original playing field to the west. Fieldwork was carried out by Surrey County Archaeological Unit in a number of phases, including both evaluation and excavation, and there is an account of the investigations on the new playing field site. This report focuses on the results of the fieldwork carried out on the former playing field, between September 2007 and March 2008, ahead of the new residential development. The site was located on the Bagshot Beds Sand, but gravel deposits were also identified, and are thought to be traces of the Taplow Terrace, River Terrace Gravel. The topography of the site was variable, with the main excavation area situated on a gently sloping plateau of higher ground, but beyond the excavation boundary, the ground sloped steeply down towards the river Bourne. The evaluation trenching showed that a range of features were present, dating from the Mesolithic through to the Middle Iron Age, however the density of the prehistoric settlement was not realised until stripping of the site took place. The site was consequently excavated in small chunks, allowing construction work and archaeological investigation to take place simultaneously. 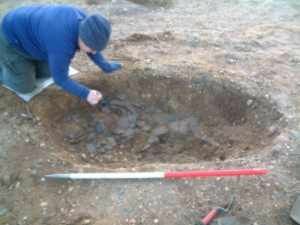 Three small pits contained Mesolithic flintwork, which due to the high percentage of burnt flints and knapping residues, appeared to have been purposefully deposited. 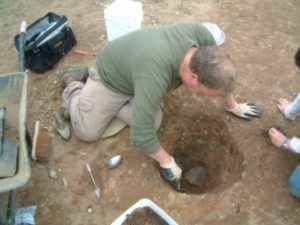 Similar pits have been found at other sites in Surrey including Charlwood and Perry Oaks, suggesting this type of pit may be a recognisable feature, attributable to the later Mesolithic period in the south east. Two very deep pits were of even greater significance, as features of this type have rarely been identified or interpreted. The features were not waterholes, as it is unlikely they would have ever reached the water table, nor are they likely to be flint quarry pits, as gravel pebbles occurred in surface deposits on the site, and would also have been easily collectable from the nearby river bank. The pits are therefore interpreted as animal trapping pits, which subsequently silted naturally as they fell out of use, incorporating Mesolithic flints, but no later material. A number of tree throws give an indication that the landscape was partially wooded at this time. A small cluster of features dating to the Late Neolithic or Early Bronze Age, were identified in the northwest quarter of the site. The presence of Beaker pottery in two of the features is of some interest, as this period has been difficult to document in the region. The later Bronze Age evidence on the site consisted of three cremations, an isolated pit to the west of the site, and a small cluster of features in the southeast corner of the excavation area. The features appeared, however, to be peripheral to a series of ditches discovered on the new playing field site, marking the beginnings of formal organisation of the landscape. The presence of sheep bone and puffed cereal grain in Middle-Late Bronze Age deposits, shows domestication of crops and animals, and a shift away from a hunting and gathering economy. The fact that all the features with such material contained special deposits may, however, indicate that such foods were important and special commodities at this time. The most extensive use of the area occurred in the Early-Middle Iron Age, when a range of settlement evidence could be identified. The intensification of settlement on the site during this period shows the establishment of a settled community functioning within an organised landscape, and the choice of location close to the river, probably gave an important strategic position for industry, transport, and trade. Environmental evidence from the site indicates the presence of oats, wheat, and barley, indicating a farming economy. The presence of four and six post structures also supports the evidence for farming, as it would have been possible to use these structures for a range of storage and processing functions. One four poster contained a broken quernstone in one of its post holes, perhaps providing a link to its use as a grain store. On other sites in the Thames Valley, four posters have also been linked to the storage of fodder, suggesting an association with pastoralism, though because animal bone survival was very poor due to the acidic soil, it is unclear whether this was the case at St Ann's. The use of pits as storage features (primarily for grain), with a later function as rubbish pits, has been attested on many other Iron Age sites. Whilst this may be the case for a small number of the pits at St Ann's, the majority seem to have been dug for the specific purpose of disposing of waste, with very few remaining open for long, before being backfilled with successive phases of dumped material. The mixed nature of the pit assemblages shows that industrial, domestic, and organic materials were being disposed of together, and this may indicate middening was also taking place, with a possible midden identified on the northernmost edge of the site. Specific study of select pits for phosphate analysis was undertaken, inspired by the studies begun at the Brooklands site, where it was suggested that some of the pits may have had a primary function as cess pits. High phosphate levels from a number of large pits at St Ann's Heath School support this idea, as do the multitude of thin lenses of ash and sandy soil, a characteristic of cess pits, where soil layers are added to aid decomposition, and tamper upcoming smells. Evidence of ritual or ceremonial activity came in the form of a number of placed deposits, in particular dating to the Late Bronze Age and Early Iron Age. The placing of items such as querns may be linked to an agricultural fertility rite, and a number of features showing evidence of acts of termination, may show links with cycles of life and death. The inclusion of additional deposits in some of the cremations, including a possible food substance, suggests a view incorporating the concept of an afterlife. All of the placed deposits were physically located within the boundary of the settlement, showing the close integration of both the sacred and the profane. The roundhouse ring gully was the only identifiable evidence for a dwelling, however, it is possible that other structures may be represented by some of the apparently random post hole configurations, or by empty areas between features, where the construction method did not leave a trace, such as with turf or cob walls. The orientation of the roundhouse in a northwest direction is unusual, as it is more common for such structures to face a southerly or easterly direction, towards the rising sun. A comparable west facing roundhouse was found at Brooklands, but its orientation probably directly related to the industrial activities taking place on the site. This does not seem to be the case at St Ann's, as the roundhouse dated to the Early Iron Age, but the majority of metalworking residue was Middle Iron Age, leaving the reasons for a northwest orientation unclear. The production of iron is one of the most significant elements of activity identifiable at St Ann's Heath School, and it appears to be one of a number of such sites identified in the northwest Surrey region. Analysis of the slag and hammerscale residues shows the majority of material was related to iron smelting, as well as primary smithing to consolidate the blooms. The vast majority of metalworking material came from pits on the periphery of the settlement, that had dumped fills consisting of mixed domestic and industrial waste. Most of the material was in a secondary location, but probably not far from its original zone of activity, suggesting that metalworking took place on the edge of the settlement. This location may be practical, for example to separate domestic activity from the noise and acrid smoke produced by the process, or it may be ideological, for example, to create a division to keep people away from the perceived 'spiritual danger' of ore transformation. The possibility of iron production being a specialist activity seems likely, and the ability to undertake such processes may have ensured the community at St Ann's held an important trading and social position. The location of the site within the grounds of St Ann's Heath School, meant that educational visits were possible, following on from similar activities organised during the excavation on the new playing field site. The children were able to learn about the archaeology and history of their area, and about how archaeologists work, and based some of their academic work on their experiences. Site tours were also arranged for interested local history groups, providing an opportunity for first hand viewing and detailed discussion. The excavation ahead of the new residential development at St Ann's Heath School, has been of considerable interest, as it has produced extensive evidence of occupation, economy, industry, and ideologies for the earlier Iron Age, as well as evidence of activity during the Mesolithic, Neolithic, Bronze Age, and post medieval periods. The information acquired is both of regional and national importance, and addresses a number of issues raised in research frameworks for the area. The earlier Iron Age in particular, has also been recognised nationally as a period with high research potential, as it is poorly understood compared to the later part of the period. The assessment report for the site is now complete, and it is hoped that further funding can be secured for supplementary analysis and publication of the excavation results.